As an entrepreneur, Sukanto Tanoto’s entrepreneurial spirit has been passed down to his children as well. Imelda Tanoto, Sukanto Tanoto‘s eldest daughter, has been involved in the business operations for the past 7 years. During these 7 years, she has been exposed to different functions of the organization. Given the influence from her father since young, Imelda Tanoto is continuously finding ways to expand the business. When opportunity in Canada arises, Imelda Tanoto decided to take the calculated risk and went on with the investment in LNG market in Canada. Imelda Tanoto signed Letter of Intent with British Columbia Premier, Christy Clark. Currently she oversees her family’s investments in Canadian natural gas supplies through Woodfibre LNG. The company, with the backing of the $15 billion RGE Group headed by Mr. Tanoto, recently signed a letter of intent with the government of British Columbia. The letter outlined the parties’ common goal of directing supplies of liquid natural gas from Canada to Asia by the early part of 2017. 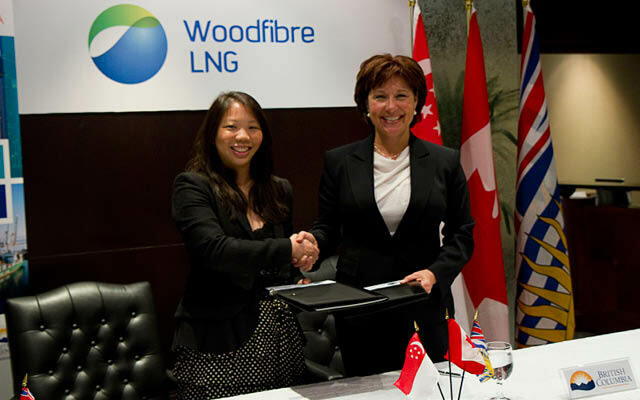 As lead director of Woodfibre LNG, Imelda Tanoto participated as a signatory to the document, along with British Columbia’s premier, Christy Clark, during a trade mission. Other international companies, including Royal Dutch Shell and the Malaysian state company Petronas, are also engaged in exploring liquid natural gas exports from western Canada. Canada, which is ranked fourth among nations worldwide in the amount of natural gas exported, currently serves a largely U.S. market. However, due to Canada’s vast reserves of shale – from which liquid natural gas is derived – in the provinces of British Columbia and Alberta, and a strong upward trend in demand from Asian markets for LNG supplies, the partnership between Woodfibre LNG and Canada is expected to be a good fit. Canada currently lacks the kind of infrastructure that would support its expansion into the Asian sector. However, Woodfibre LNG is proposing the construction of a new facility for processing natural gas, as well as Canada’s first-ever terminal for exporting natural gas abroad. Under the direction of Imelda Tanoto, the Canadian facilities would be built on the site of an unused pulp mill in an industrial area in the town of Squamish, British Columbia, located about 40 miles from Vancouver. The region is home to needed features such as a deepwater port, a preexisting pipeline, and an electrical power infrastructure. The $2 billion facilities would be set to export a little more than 2 million metric tons of LNG annually. On the final post for Jusuf Kalla’s statements made during the Tanoto Entrepreneurship Series on 30 April 2013, he touched on the importance of having the right attitude during the start up and growth stage of a venture. In fact, attitude is one of the most important determining factors to the success of a business. In any start up, the process has to be gradual and step by step; and hardships will definitely pay a visit during this process. RGE, owned by Sukanto Tanoto, and all the companies under the group, faced many difficulties and hardships throughout the growth stage of the venture. These difficulties vary from internal to external situations and come in different sizes. Nevertheless, having a high resilience enabled the company to always bounce back stronger after every crisis it faced. Jusuf Kalla also mentioned the importance of innovation. Taking a glance at the businesses present in the market, many of them started because people were not comfortable in a certain situation, thus, were forced to think out of the box to innovate and improve. For example, the number of retail stores such as Seven Eleven, Alfamart or Indomart in Indonesia has grown significantly because people do not enjoy going to wet market anymore. They would rather go to stores that are clean and comfortable. He also pointed out that given the better access to information and the availability of technology at your fingertips nowadays, it is relatively easier for young people nowadays to innovate. The point is to have courage to be an innovator and not a follower. Most of the innovations seem impossible at the beginning however, many of them were proven to be possible. It is however, not wise to rely on intuition when making a decision. Even though it is true that a good intuition comes with a great deal of experience, Jusuf Kalla advised that we still need to carry out our actions based on calculated risks. This is because as an entrepreneur, absorbing the risks comes as a package together with the results we reap. In order to do an accurate calculation of risk, we need information as the basis. RGE has also invested heavily on Research and Development to continuously improve on their processes and products. Besides this, there is also a bottom-up continuous improvement activities that enable employees to spearhead innovations and process improvements. Jusuf Kalla’s statements suggest that he will ensure the availability of necessary technology and internet access in the nation in order to support and provide the massive amount of information required in a growing economy. 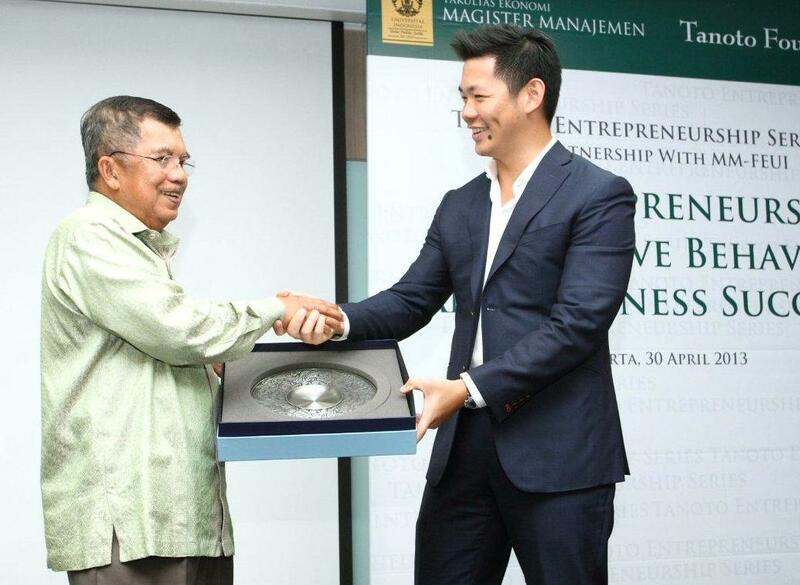 Jusuf Kalla attended the Tanoto Entrepreneurship Series on 30 April 2013 at University of Indonesia. Tanoto Entrepreneurship Series is a joint effort by Tanoto Foundation and University of Indonesia to prove that young people in Indonesia have the capabilities and potential to be a successful entrepreneur. Tanoto Foundation was founded by Sukanto Tanoto, an entrepeneur from Indonesia, Medan. His son, Anderson Tanoto was present at the event together with Jusuf Kalla. More than just a hindsight, statements made by Jusuf Kalla during the event has many strong relevance to the current leadership that he holds, as a Vice-President of the world’s 10th largest economy by share of world GDP in 2011. Details can be found here. On Entrepreneurship, Jusuf Kalla mentioned that even though the government manages, provides the facilities, and develops the infrastructure, entrepreneurs are the ones who build the country. Without entrepreneurs, the country will not run. This is in line with Sukanto Tanoto’s belief in running his business – it is important not to rely on special privileges from the government and use it as your main success factor. A business has to own a strong competitive advantage in order to outlast and outrun competitions in the long run. Jusuf Kalla also mentioned that Entrepreneurship is an attitude that requires adjustments to a particular situation. Similar to Nike’s slogan, it is about ‘Just Do It’, because more often than not, when we think too much, it is not going to happen. JK’s emphasis on “Just do it”, flexibility and result orientation is aligned with RGE’s “Think, Act, Learn” and “Achieve results through systems”. Sukanto Tanoto believes that these 3 principles are the basic foundation of building a strong enterprise. Lastly, JK mentioned that entrepreneurship is a combination of several key characteristics; one of the most important ones is to be logical. However, that does not mean that formal education is not important. As emphasized by Tanoto Foundation’s active involvement in the education sector, Sukanto Tanoto and all business under RGE are strong advocates of education. With these understandings in mind, we can see that Jusuf Kalla knows the Importance of entrepreneurship as the foundation of the country’s economy and he knows that there needs to be a practical and tangible support provided to build the entrepreneurs landscape in the country through practical experience and education.